Valentino Bontempi’s eponymous restaurant is a treasure waiting to be discovered. Discovery is the word, and only the intrepid will succeed. To get to it and in it gives a sense of well earned success, even before the reward of discovering the cuisine has begun. The old Red October Chocolate factory complex on Bolotnaya Island is a veritable phoenix. Until recently, the maze of red brick factories, warehouses and rabbit runs jumbled into the site like a shaken chocolate box was looking well past its sell-by date. Now, however, no month passes without another new nightlife hotspot, art gallery, craft workshop or fashion boutique opening its doors. The area is fast becoming a bohemian paradise, the place to be and to be seen. It is anarchic and fluid, with change being the only constant. A model for modern life, as consuming the good things of life replaces the making of chocolate confections. It is a work in progress, a living experiment and creative laboratory. 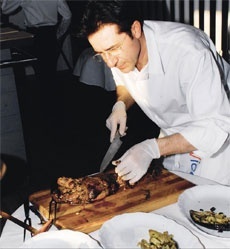 Enter today’s hero, Valentino Bontempi, chef, restaurateur, writer and entrepreneur. Sit at an upstairs window table, with views of and across the river, watching the sunset lights changing, and listening to our host’s effusive enthusiasm and be carried into an enclave of Italy. Valentino loves Moscow, loves cooking and loves Italy. He is dedicated to providing the authentic taste of Italy. No compromise, no sushi. The restaurant is elegantly Spartan in décor: functional without being distracting, allowing the maximum of investment in the cuisine. After coming to Moscow to be head chef at the expanding and agreeable Jean Jacques group, Valentino set off on his own last October. His menu is precise and purposeful, with extras on a chalkboard. The range of Italian delicacies without needless duplication. As he explains, the quality of ingredients is key. While some of the fish comes from home, of necessity, and meat for the Osso Bucco from Canada, as much as possible comes from Moscow’s splendid markets, Dorgormilshi in the van. A table, citoyens! Our evening was something of a progressive meal. Guests and chef arrived and left at irregular intervals, making for more of a smorgasbord than a set feast. We therefore enjoyed sampling delights in unusual orders, no bad thing at all. One constant was an exceptional wine, which kept us good company throughout. 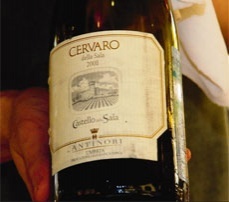 The 2008 Cevaro comes from the Umbrian hills above Florence. 85% Chardonnay gives the reliable body and durability, and a lineage back to 1458 adds the distinctive local taste. The hors d’oevres were so delicious, we kept ordering more. Whitebait in batter, and slivers of anchovy in wafer thin fried bread As you would expect in Italy, the bread basket is a masterpiece in itself: panini, slender sticks, salt bread and coated hot rolls to melt in the mouth. Next up, I savoured the subtleties of Pasta al Funghi while the two Johns tucked into substantial dishes of wild boar and bourbilliase. 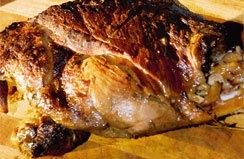 The former was full of flavour, in both meat and sauce, and a great favourite of any Mediterranean hill area. 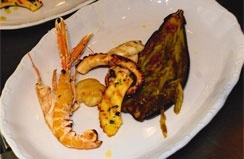 John Ortega cheerily disappeared behind a huge serving of the iconic port dish, with fish, clams, giant prawns and scallops wrestling for attention in a sauce of even more flavours. Olesya could not be distracted from her Lenten diet, so she sampled a vegetarian Lasagne. A good test for a chef, to entertain the palate with a restricted range of ingredients. Easy! Quality pasta, interleaved with tomatoes, carrots, aubergine and leek did their jobs together. And if all that does not entice you, wait patiently for Valentino’s own party piece. Concocted at your table, an exquisite Mango sorbet to die for, chilled as it is whisked in a tornado of liquid nitrogen. With only 92 covers, (and an alfresco extension for the summer) the atmosphere is personal and familial, but booking is essential, especially for the long weekend evenings. How to get there. Despite the two new and fanciful footbridges, access to the area can be confusing, a healthy stride from a Metro, something of a labyrinth to navigate by car. 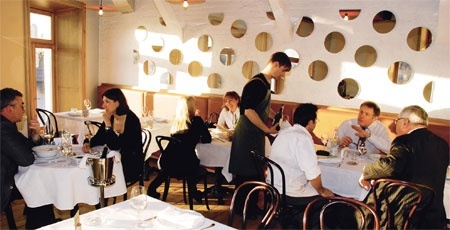 Bontempi restaurant itself is unmarked and devoid of ornamentation. Not even a web address. But well worth the quest. Persevere! You will be richly rewarded. By way of hints, it is on the embankment and adjacent to the better-arrowed Strelka Bar, itself an ideal place to meet and to watch the beau monde passing by. By way of a digestif, they did us a generous and sparkling Margarita cocktail to round off a splendid evening.